Graphite shafts are lighter than steel shafts, which can make for an easier swing. You have been shopping for a new set of golf clubs and might have noticed those with graphite shafts are more expensive than those with steel shafts. While the extra amount might not be in your budget, consider graphite shafts might be better for your game. Graphite shafts are considerably lighter than steel shafts so they are easier to swing faster and have your golf ball go farther. Combine a graphite shaft with a titanium club head and you'll swing even easier that that. Because of how a graphite shaft is constructed, when you hit a ball with one, it's as if the shot is muffled even though the ball travels at least as far as one hit with a steel shaft. 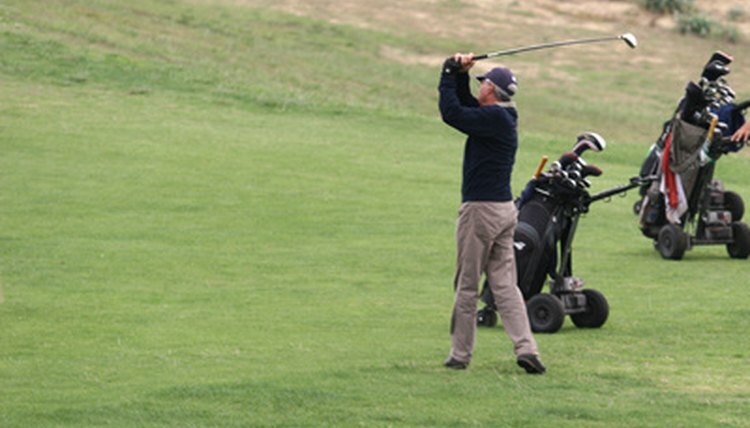 Consequently, you will feel less vibration from the shot, particularly if you hit the ball slightly off-center. Just like steel shafts, you have a choice of five flexes, and they are dependent on how you strike the ball. Flex is how much a shaft will bend when you swing the club. The greater the flex, the more the shaft will bend. There are ladies, seniors, regular, stiff and extra stiff shafts. If you hit your drives fewer than 200 yards, you probably should choose a ladies shaft. But if you hit it 250 to 275 yards, you should think about ordering stiff shafts. Steel and graphite have the same flexes. Most golfers find graphite shafts make a difference in the longer clubs such as the driver or long hybrids. But for clubs that require less length but more accuracy, they often opt for steel shafts. If the cost of an entire set of clubs with graphite shafts is a problem financially, there are good reasons why you might have some clubs with steel shafts.